Beer geeks are now seeking limited-edition #juicy "pounder" cans. Here are the breweries to keep on your radar. Only suckers buy IPAs in bottles these days. Or purchase them from a supermarket. After all, they could be *gasp* a week old, and no longer “fresh." I’m kidding—somewhat. But it’s hard to ignore that many of today’s most coveted IPAs are generally being packaged in 16-ounce “pounder” cans sold exclusively from their breweries, a day-old in freshness, and usually in highly-limited quantities that necessitate queueing up, sometimes for hours. The Alchemist’s Heady Topper started this trend in the early 2010s, and while it’s still an iconic beer, it’s become a little passé amongst the cognoscenti. I wrote a “What Will Be the Next Heady Topper?” piece back in 2014 that’s almost obsolete these days, even if many of the beers I highlighted are still around, and still darn good. Back then there were only a dozen canned IPAs, almost none of them limited. But now it seems like everyone is cashing in on the brew of the moment, with 4-packs of these featured IPAs usually sell for $15-$20. It should be noted the vast majority of these ballyhooed beers are what is known as “New England-style” IPAs, lacking in much bitterness, dry-hopped to oblivion to produce an insanely fragrant aroma, soft in carbonation and thus crushable like a glass of orange juice, and about as hazy as some pulpy fresh-squeezed too. It's best to drink them immediately in order to truly understand their greatness. Which is one reason why cans work so well for the packaging—not only are they lighter for carrying in bulk, but they also prevent UV light penetration and oxidation. If you notice a brewery hashtagging #hazefordays or #juicy upon announcing a new beer release, you’re probably destined to stand in a line for awhile if you want to nab a case of that sweet, sweet nectar. Of course nowadays, it’s less about specific beers and more about specific breweries. If today’s hottest hop-mongers—most of them indeed based in the northeast—have a canned IPA release, most folks don’t even need to be told what is being released. They will still set their alarms for early in the a.m., grab a lawn chair and cooler bag, and head to the brewery parking lot. The canned, New England-style IPA is the beer geek’s strongest currency of the moment, which is why most of them find it worthwhile to max out their “limits” (usually a case or two per beer). At the least, you can trade the beer to some other sucker if you end up not being a fan of it. Yes, there are still plenty of great bottled IPAs, even ones getting wide distribution to retail spots in all 50 states—but unfortunately, those “shelf turds” simply don’t get bearded nerds excited these days. The following breweries are the ones releasing the canned IPAs that are truly causing a commotion. Now I just told you the modern beer geek has become way too cool for Heady (“I drank it back before you’d ever heard of it!”) but, alas, The Alchemist still has IPAs that’ll get him in a tizzy. After Hurricane Irene destroyed The Alchemist brewpub in 2011, owner John Kimmich, upon building a production brewery, decided to focus exclusively on one beer—his already celebrated Heady Topper. Cans of it were such a hit—it eventually became “The Best Beer in the World”—that in 2013 the brewery was closed to the public due to traffic concerns, and Heady searchers were forced to troll Vermont markets hoping to land a haul (unaffiliated online resources like Heady Spotter even arose to help them in their quest). Showing he’s not just a one-trick pony, earlier this year Kimmich opened a new, bigger brewery location in Stowe, where the public is again able to visit. Even better, they can now score cases of not just Heady but double IPA The Crusher and Focal Banger, a citra- and mosaic-backed IPA which many consider his actual best offering. Heady may have started the stand-in-line-for-cans trend, but Tree House has seemingly turned it into their business model. They burst on the scene in 2012 with Julius, a then one-of-a-kind tropical explosion as orange as a construction cone and hazy as the mall treat of the same name. 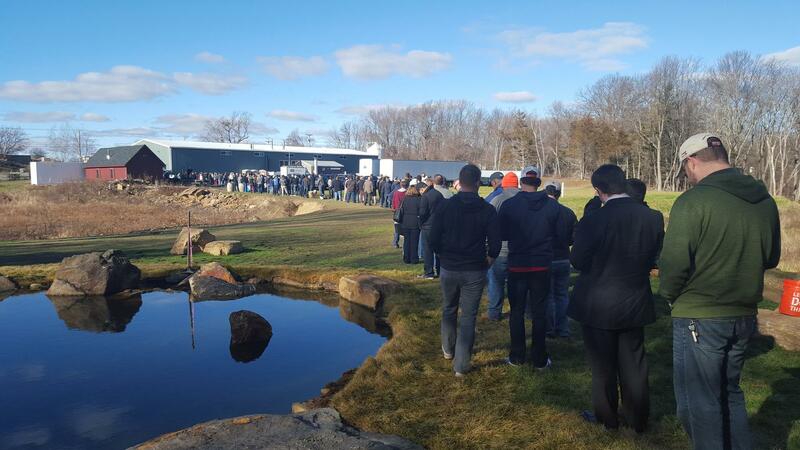 It proved so popular that, upon getting canned last year, beer fans were soon venturing to rural Monson to line up on a daily basis in the hopes of scoring some. By now Julius isn’t even Tree House’s most coveted canned IPA; offerings like Haze, Very Hazy, Juice Machine, and Julius’s “big brother” King Julius have proven to be feverishly desired. Cans become available literally the day they are packaged, and these uber-fresh IPAs are now some of the highest-rated beers in the world. If you ask me, Trillium’s hoppy beers are every bit as great as Tree House’s—and Trillium is in Boston no less!—yet rarely does one have to deal with long lines to nab their wares. (Such is the beer geek’s insatiable thirst for beers that actually take effort to land.) Earlier this summer, the South Boston brewery began offering all their hop-forward beers in cans, unsurprisingly a move based on customer demand. Trillium’s IPAs are technically distributed to about 30 accounts around the city, but heading to one their two brewery locales is the smartest way to score these stellar ales. Opening in 2014 in a tiny ramshackle spot just down the street from big bad Allagash, the young brothers named Bissell savvily started canning their beers right from the get-go. Back then, there was an eager line forming every Saturday to buy their flagship Substance and their slightly-rarer Swish. Since moving to larger digs with greater production capabilities this year, that problem has been alleviated somewhat (especially if you go earlier in the week). While most of these highlighted breweries won’t let you know what cans are upcoming until a week or so before release day—it makes you wonder if the breweries themselves even know what they’re about to brew—Bissell Brothers quite politely has a can release schedule for every day they’re open. Many of these other IPA producers are in smaller towns, or the boondocks, leaving Other Half to answer the question: what would happen if a hot brewery opened in Brooklyn, an hour’s radius from perhaps 20 million people? Every other Saturday, sometimes starting as early as 4am, tristate and beyond beer geeks wrap around a Carroll Gardens’ block, forging a line that sometimes takes four to five hours to get through—and that’s once it’s started moving. Luckily the pot of beer at the end of this rainbow is pretty great. Other Half releases a silly amount of different IPAs, sometimes four new ones biweekly, many of which are collaborations with a lot of the other breweries mentioned here. Once known mostly for their farmhouse ales, their most famous beer now is actually their hoppy, oat-based pale ale HopHands. Still, once they started canning IPAs at the end of last year, Philadelphia-area beer geeks started showing up to their “Fermentaria” brewpub in droves. Tired Hands loves using spelt and oat in their IPAs, somewhat atypical ingredients that add that thick, hazy body so desired these days. Also unique from these other breweries, Tired Hands has found a robust business in canning fruit IPAs under their “Milkshake” label. And offerings like Strawberry Milkshake, Lychee Milkshake, and Double Mango Milkshake have proven big hits and bigger trading fodder on online message boards. “Why can’t you just make more?” has long been the whine of the beer fan shut out in landing many of the IPAs mentioned here. Which makes it so remarkable that The Veil opened their doors—just this April—with a plan to offer cans right from the get-go. Even if these great beers are coming courtesy of a former The Alchemist brewer, show up to the brewpub early in the week and four-packs will almost certainly be yours. The Veil’s hazy, juicy IPAs are the antidote to those who claim “I hate IPAs—too bitter.” In fact, their limited release IdonteverwanttoBU has literally 0 IBUs (International Bitter Units). This brewery north of Columbus is one of the midwest’s few purveyors of limited, canned, and hazy IPAs—and they might actually make the haziest IPAs in all the land. In fact, the internet has often mocked the appearance of Hoof Hearted’s offerings, comparing their creamy viscosity to that of salad dressing—or something worse. Whatever the case, their light-heartedly-named, outrageously-labeled IPAs continue to be well-reviewed and highly desired. That’s especially true for the Instagrammable Konkey Dong and Everybody Wants Some, a rotating line of IPAs where various hops are swapped in and out. Of late Hoof Hearted has started doing ticketed events, only a few hundred sold, which guarantees a person several four-packs. It’s almost a cheat to include Grimm, as they aren’t quite playing by the rules I’ve set forth. As gypsy brewers, no, they don’t currently have a brick and mortar to attract geeks like moths to a flame. Still, their release schedule to retail is so regular, their juicy IPAs so expansive, and their fans get stirred into such a frenzy, scurrying around town to various stores looking to land cans, that it would be hard not to include them in a round-up of this nature. Page Other Half Brewing Co.